That's great news Happy Birthday to you have a great Day!!!!! I tried Marks suggestion post #22 but instead of listening for sound I hooked up the test light to various points. light lit on pulse 5 actually lit in between steps 4 and 5 of the Score Motor, when 3C,and 4C drop in the notch of the motor. The BL+RED leaf is solder to the 4C middle sw. next to it and the other leaf has a GR jumper on the other leaf which is connect to M4A outer sw.
which has the same pulse which is the WH-OR wire. (c) Attached light to M4A WH-OR leaf outer sw. and turned motor and lit on the 5th step .did the same for PB WH-GR leaf and got the same result. This was all done without moveing the connection to the PU BLK side. (a) Attached one end of the light to the BLK side of the player unit coil and the other to M4C outer sw. BL+RED and turned motor by hand slowly and light lit on pulse 5 actually lit in between steps 4 and 5 of the Score Motor, when 3C,and 4C drop in the notch of the motor. I think this confirms what we've suspected, that you're getting an extra pulse through the Score Motor 4A and 4C switch path. No part of the blue-red wire should be wired to any part of the Score Motor 2C switch. Are you saying that they are? (another post to come to posts -48 to -52) I am - maybe You too - I am under pressure to make some progress. A long time ago You wrote: "Sneaking-in a stripe of paper inbetween the Switchblades of the Switch-motor-4A makes the pin to step correct (in a Two-Player-Game) from Player-1-Ball-1 to Player-2-Ball-1. I was fearing "troubles on the last ball" when keeping this switch always open - but well, lets try and look if You have troubles on the last ball: Make*** this switch stay open all the time - then start and play an Two-Player-Game through the balls --- does the stepping always work ? - when You come to Player-1-Ball-5***: Does the Bonus-Multiplier comes on ? - when You come to Player-2-Ball-5*** and You play and then loose the ball: Does the pin changes to "Game-Over" ? - Does the Number-Match-Light in the Backbox comes on ? Player-1,2-Ball-5***: When You have the pin set to three balls per game: Read "Ball-3". P.S. 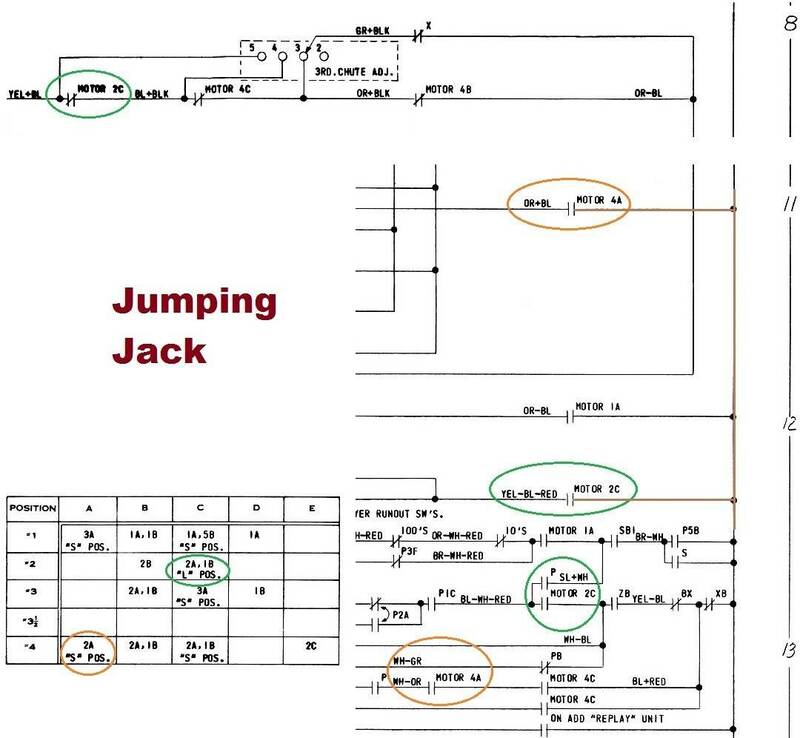 : The schematics tells me that there are TWO switches mounted in the stack "motor-4A" - one has wires RED-WH and OR+BL is Orange-mingled-with-Black. The other switch in the stack has wires WH-OR and unknown (schematics) color. Adjust this "other switch". - leaf means "wire" ? - next to it - well, 2c middle sw. next to what ? - and the other leaf has a GR jumper on the other leaf - well, other leaf, other leaf ? 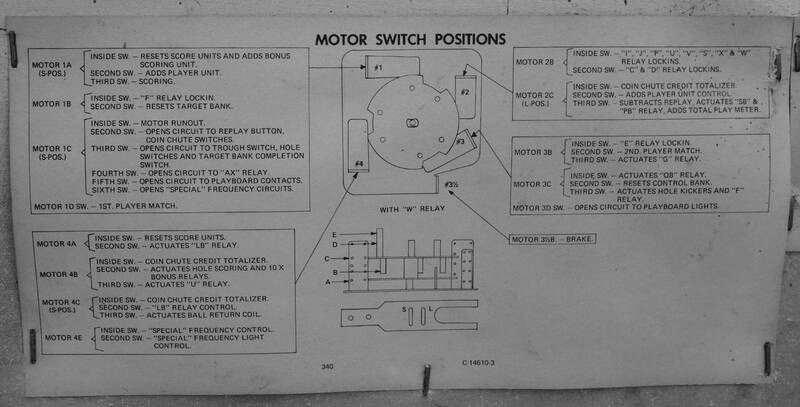 Hmm, GR Jumper which is connect to M4A outer sw. - this "M4A outer sw." makes me to look up in the schematics - O.K., on position motor-4A there are two switches - I look all over the schematics to find these two switches (see the first JPG, "orange") - O.K. I see a connection from motor-2C (first JPG, brown lines) to motor-4A - but these switches are not of interest - have nothing to do with the "fault in stepping"
- which has the same pulse which is the WH-OR wire - well, Yes - when two switches are mounted on the very same motor-position then they are actuated synchronuous - or what do You mean with the " which has the same pulse which is the WH-OR wire" ? Another thing - in post-49 You wrote an observation: "Put testlight on the PB WH-GR Leaf and ground on the reset bank and lit up when on the 1st player" --- hmm, see the second JPG - it is "Two-Player-Game when the first Player plays Ball-1. I marked "red lines" everything that has power, current "ready to flow", this is wanted. When "Switch P2A" is faulty, faulty all three blades have contact: My "marked pink wiring" ALSO, faulty is "has power, current 'ready to flow' " - this of course is not wanted, this does match with Your observation "lit up when on the 1st player. Please have a good look on this Switch on the Player-Unit (P2A). First off thank you for your input. Actually I block 4C middle sw. that has a green jumper going to 1 side of 4A outer sw. with the WH-OR on the other side. The game steps correctly through the game and goes to game over. 2 player game when sw is block. I believe that the bonus multiplier is working lights up yes. The match unit is working and showing the numbers and awards free game on match. You mention is orange mingle with BLK ? if you mean on the motor switch stack the answer is no. How about f, g, h. I wrote about I think this may be significant. How about (h)??? 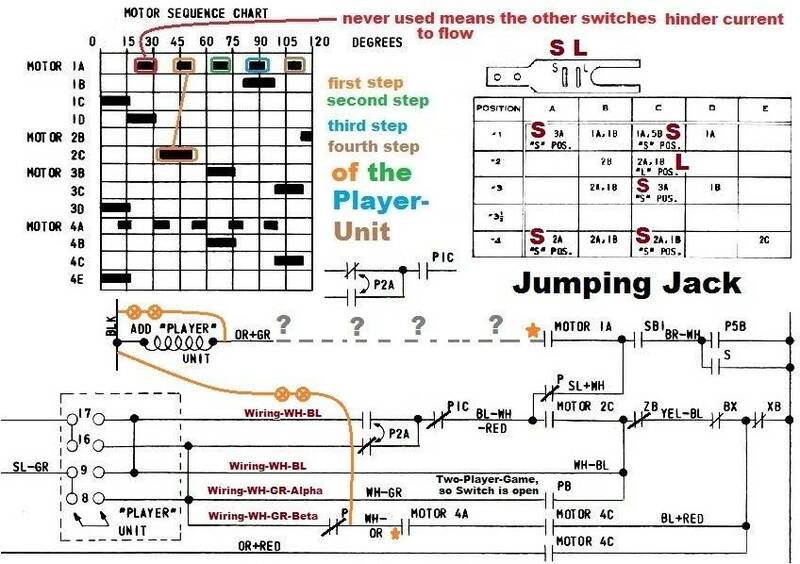 the Motor Switch Chart - look here https://pinside.com/pinball/forum/topic/pin-up-score-motor-switch-position-sheet#post-2599599 - the same as You show in post-12, maybe a bit better for "print out". - we must be very precise talking the right / true color of wires, switch positions etc. - "leaf" - good - a simple abbreviation of "solderpoint of a switchblade where wire of color XY is soldered-on"
- middle switch 4C, outer switch 4C, jumpers etc. --- we must live with the fact "the schematics are drawn abstract / neat looking - the reality in the pin is wired other" - the only thing we can say "I see a (maybe long) connecting wire / line in the schematics, NO SWITCHES in this wiring --- then in reality in the pin THERE is (maybe just a short jumper) a direct connection". On behalf of "temporary cut / block this wiring": It does not matter if You block 4C or block 4A --- In terms of troubleshooting I would like You to inspect 4A - truely open when not actuating ? - the match unit is working --- fine. - orange mingled with BLK --- what colors of wires do You have on the INSIDE-Switch on stack "motor-4A" - the schematics says "RED-WH", "OR+BL" --- grumble, a fault I often do: I mix up "BLK is Black" and "BL is Blue" --- O.K., I meant Orange-mingled-with-BLUE (((and I read the first sentence in this post, again and again and again))). - Meaning M4C has the same pulse as M4A WH-OR --- IF, if, if You have the fault in Your pin - the fault I believe You have in Your pin - the fault 'at location motor-4A' You do not have a switch (open, sometimes closed) - You faulty have an closed switch (acts as a simple connecting wire) --- IF, if, if You have this fault: Then You detect "same pulse" but actually it is just the closing of M4C You detect on different places. See the JPG in post-44, upper right corner: 4A must close before 4C closes - 4A must open just after 4C has closed - only for a very, very short time both are closed (in a functioning pin). 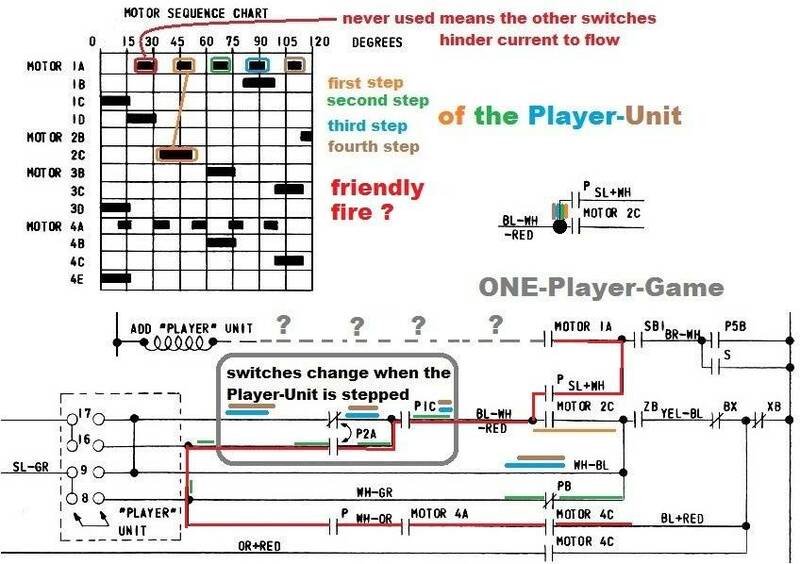 - how about f, g, h. --- f: when the PU is in position "Player-1 is playing": P1C must be open so current can not flow - You detect current flowing so P1C is faulty closed. --- g: Hmm, Your observation is good, wanted as P1C must be open when it is Player-1 turn, P1C must be closed all other positions of the PU. Question: How can You have the "f" and the "g" at the same time ? --- h: I also believe this is right --- the closing of motor-2C let current flow towards motor-1A /PU --- current also flows through closed motor-1C (it is player-2 playing) and further through P2A reaching its side WH-GR. Yes, I believe this is right. 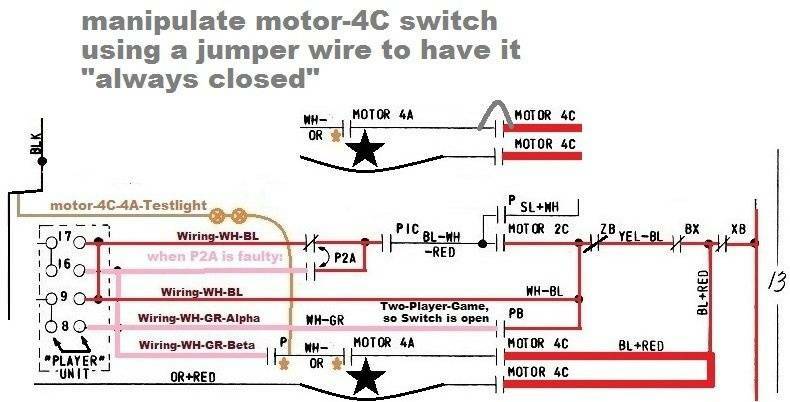 From post-55, at the end "You show Test-Light on P switch gave results 1 pulse on step 5 --- again: motor-4A must open so the "long in time closing of motor-4C" can not fall together with fifth closing of motor-1A --- look if the motor-4A is faulty always closed. On a two player game of this era the trough switch is past the outhole. The ball is kicked at the end of the motor rev by a switch on 4c. when the ball passes the trough switch it pulls P which pulls O by a switch on P which turns the motor. The player unit is stepped up 1 time thru 4c and a 1a pulse. If two player relay is not tripped (one player game) (PB is on relay bank) the circuit is opened thru the cam switches on cam P1 and P2 to open a circuit to pulse the unit three more times thru 1a till the cams close the circuit and motor stops its 120 degree revolution. 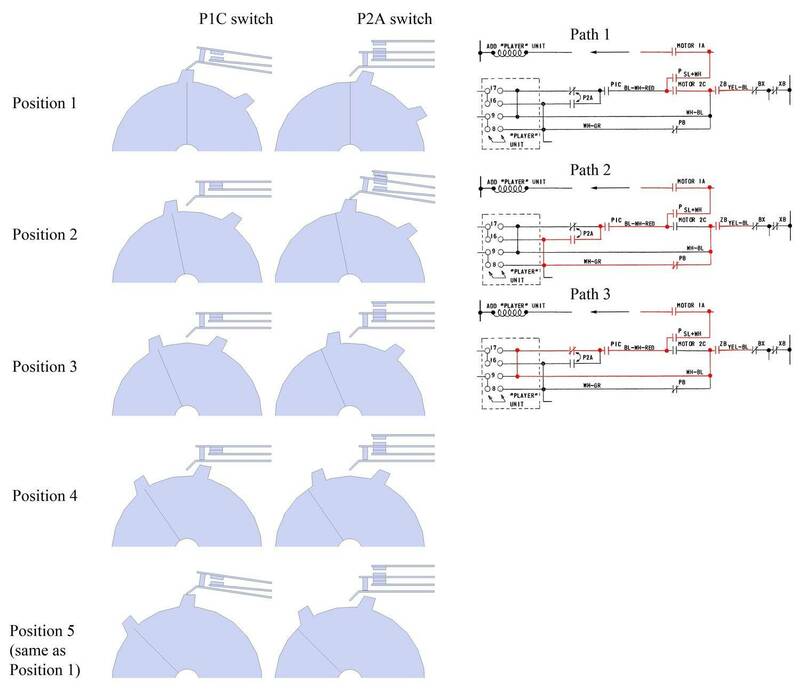 The switches on P1 and P2 are the circuits for the Three pulses to take the unit to the next ball. The PB switch open (relay tripped) is what stops the three pulses and lets the unit stop on player 2. 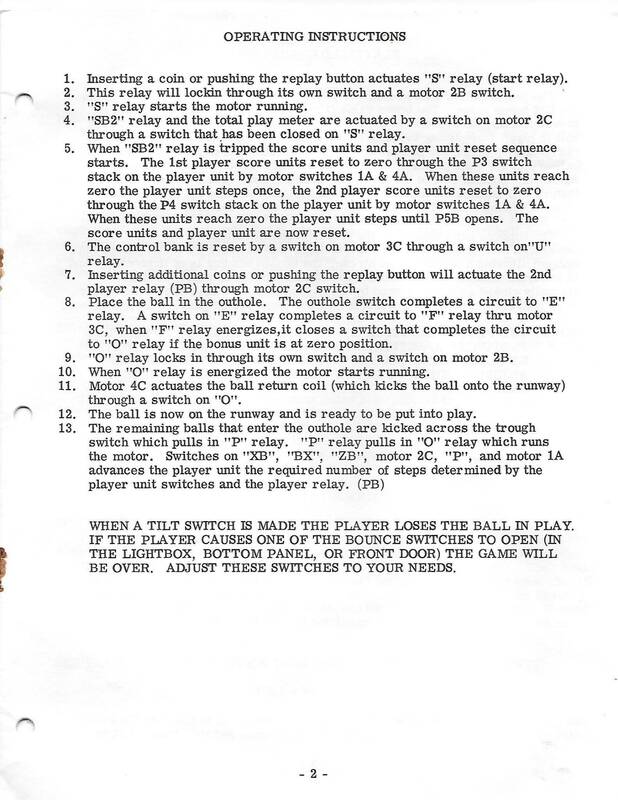 If it does not stop on player 2 when two player is chosen make sure PB relay is tripping. Always reseat the jones plug between head and bottom board and look for broken connections. Make sure all switches on PB are opening and the wire connections look good (not smashed together)Check the switches on P1 and P2. It is the second state of the process that you are getting fault. The motor is turning, pulse 1 from 1a is thru motor switch 2c. now 2c circuit is closed at about 55 degrees of rev. when unit advances it closes P1c and switches P2a to a circuit thru a closed PB switch. You get another pulse thru 1a to advance unit again. Now a circuit is opened thru a closed P1 and another path thru P2 that is direct which allows for the final 2 pulses from 1a. After the forth pulse the P1 and P2 switches are back to there starting state and the motor revolution comes to a end. frb--Finally a new pair of eyes you are so very welcome!!!! PB is tripping only 2 switches close when trip will check again. How is the circuit to the PB switch form, through the bakelight disc rivet #16? or the make break switch P2A switch which has a green jumper from P1C and the 2 other outside tabs are WH-BL and WH-GR Player 1 starts on the WH-BL side of the sw. P2A and than switches to the WH-GR wire and the jumper from P1C. I guess this is the wire to trace back to the PB switch? I believe I check for continuity from and two the PB relay. I'll check it again. rolf martin That's what it looks like to me WH+RED OR+BL post #51 (b) I show picture of stack 4 whats this about anyway??????? If the LB relay does not work has is it able to go to game over? Look at the PIC and P1A and all the switches in the player unit all look good to me. I'll try to adjust M4A since you where talking about the motor sequence chat for so long now. Check Player unit WH-GR wire P2A ? I'll check the wiring to the PB relay from the Player unit. Where do you think the extra pulse is coming from a timing issue with the score motor or wired incorrect ? There is a diagram in this thread of the separate circuits posted by markg. it is the state of the switches in the switchstack. the 3rd path is responsible for 2 pulses from 1a. it gets you back to the next ball player 1 state. First off I am getting 1 extra pulse after Player 1 ball drains which in term misses the rivet on the Player Unit Disk than no ball lit on Backglass. on a two player game pulses 1,3,1,3 etc till game over. Looking at the P2A switch when the cam is on the high spot for 2nd player all 3 legs of the switch are connected. That's the WH-BL Green Jumper from P1A leg and the WH-GR wire. This is a make break switch, when the cam is on its low point the switch is closed not touching any legs ? make break is the switch connecting 1 side, disconnecting other when the cam moves it. the schematic is the state of the machine that has been started in a 1 player game, ball 1 served into shooter lane and unplugged from power. no points have been scored or balls played. Yea but on this switch P2A the switch is on the bottom next to the cam first blade of the sw. is the WH-BL wire so it either is connected with the middle blade which is a green jumper in which they would be touching toghter. The other way not connected at all and at rest. Then when the switch is actived with the high part of the cam when player 2 is up all the leafs are connected at once cause the cam pushes the sw. blades upwards. look at markg graph and make your switches mirror his positions. put your player unit in a ball 1 position (look at rivets on front)then adjust the switches. pulse the unit by hand 1 time and make sure yours are mirrored. continue till you get to next ball 1 position. Any input on switch P2A Thanks for taking a look ######### BILL as I continue ?? Never came across a problem like this ,hoping this can help others as well with this Set up? HI rolf , I wish that was the cause the motor was taken apart and restored and there is no doghairs or solder blobs the only solder is between the tabs of M4C outer sw. and inner sw. I'll check the timing of the switches as posted by frb (4A 4C) some of the switches on the C level weren't lining up before the A level notch position. Like I posted in post #51 C levels matching up with the A points.? But motor is not turning at normally speed so I don't know if that would matter cause there is no way that can be adjusted? - solder is between the tabs of M4C outer sw. and inner sw. --- actually a thin blank wire should be there - soldered on - see the bottom right corner of the JPG: Schematics are drawn abstract, made beautyful --- the reality in the pin might be other - but for sure: a connection in the schematics is an connection in the pin. So M4C and M4C most likely are O.K. - A points (?) --- see top of the JPG: M1A and M4A both have five closings --- but ith an offset. To check this: I drew another Test-Light mounted on "other switch on position M4A". You are getting the one pulse that is moving the unit to player 2 position. the cams on player unit now change position and should block the next pulse because the 2nd player relay should be tripped which closed a switch on it that closed a switch to stop the next pulse to move player unit any further. The motor should only turn one revolution (1/3) turn. you should only get one pulse thru the motor switch. is your motor making an extra 1/3 rev. What motor was taken apart? I have a different perspective to add here. I know this was touched on earlier, but since you mentioned the motor rebuild, I think it would be good to take another look at the switch dog positions. You posted this in #12. Is it from your jumping jack machine? If so, it possibly contradicts the positions referenced in post #35. 3c and 4a do not have a position designated in this pic but in post #35 they do. Want to be sure the pic in post #35 is accurate. 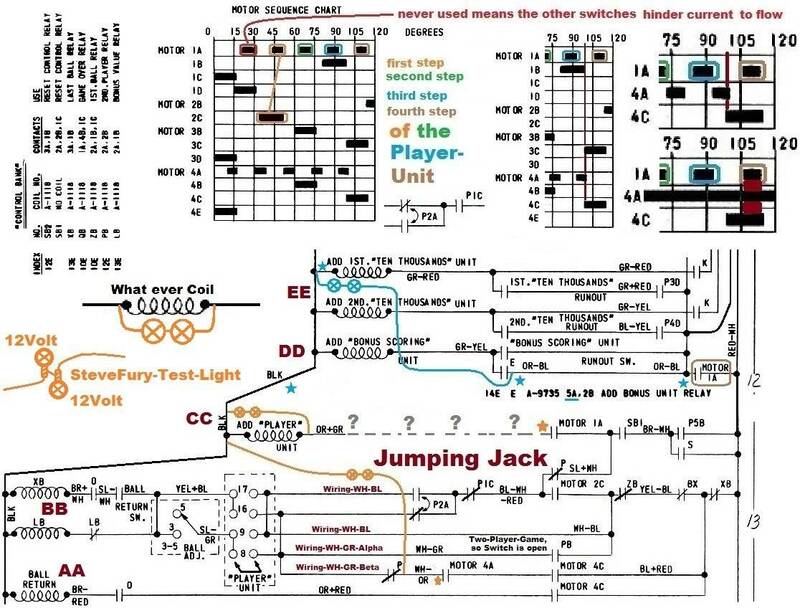 Check it with the motor sequence chart on the schematic. I posted it because I thought It would help since I was blocking 4C middle SW. and to supply information for the problem. Hmm are you done with your Hypothesis yet? Do you think this is my first pin I every worked on because my wording is not to your liking. Example the two tabs that were solder together on 4C outer 4C inner sw. or a green jumper (wire is that better?) 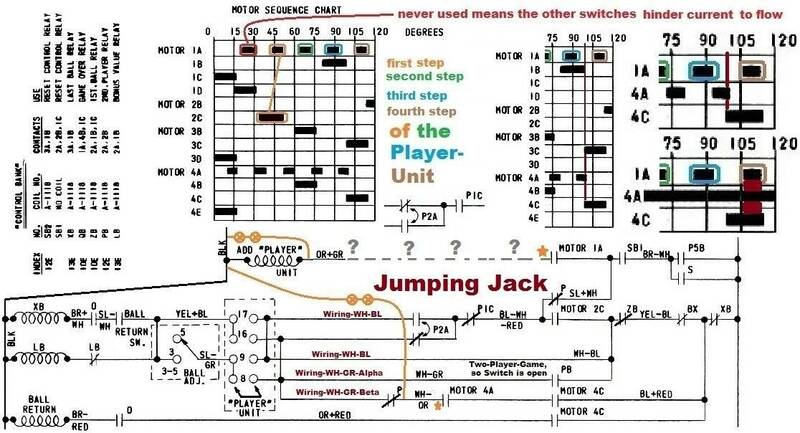 I know there are wire connections made with a solid piece of wire there all over this game jumpers solid wires in the Player Unit and relays on the switch stacks on the motor. Yes I know this is not a wire diagram but a schematic. Whats your point Anyway,? dragging this thing trough the mud. Please accept I don't want to discuss posts #56 and back to Post #1 I would like to try different things. If you have some things I can try like adjusting M4A or something like that then please respond. The picture of the card I posted is just a cropped copy of the card you posted in #12. I had a problem similar to yours on a Centigrade 37 a few years ago. After a specific event, the game would fire coils or pulse too many times. After a lot of switch cleaning and adjusting and circuit troubleshooting, the only problem was the switch dog in the wrong position on one stack around the score motor. I bought the machine in that condition. When you said your motor had been rebuilt, it reminded me of this. If you have checked all switch dogs and they are in proper positions, then I’m going to move back to the gallery and just follow along. I’ll chime in if I have other ideas. Thanks for your information I'll go over your old post and see what I can do. This is been frustrating at times and I appreciate the input that you've have given. 80 post later and all these theories.....but no results!! What do you mean by I/3 rev yea the motor only moves to the next notch on the C level 1/3 of a turn. I am going to try and trace the wires from the PB relay switches , the 2 that close. I want to acknowledge your expertise in helping me with your knowledge in the circuity of pinball. You were right on with the problem way back when you joined in with the timing issue. 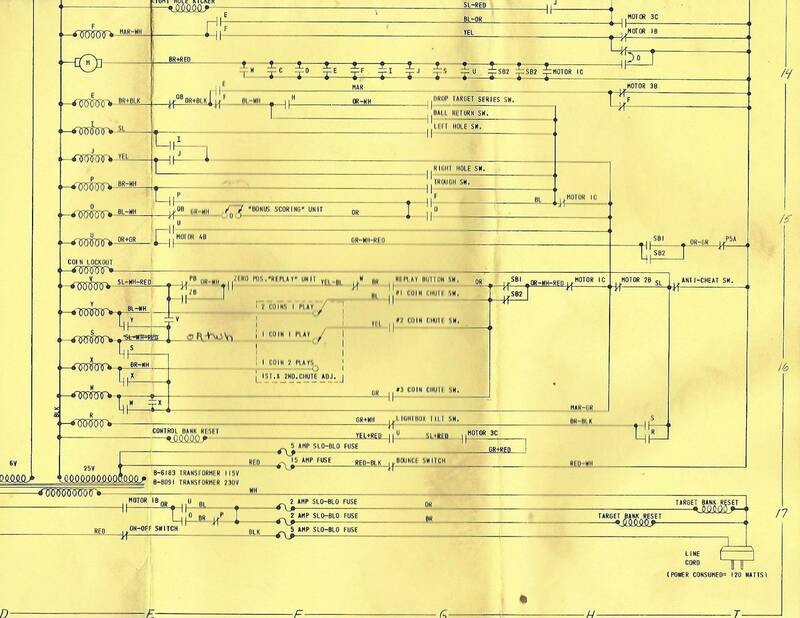 Post #19 when you brought up the motor sequence chart that was nicely shown with your diagrams. and well afterwards. I sorry I got a little heated with my words, But few people would work this long to see it to the finished. as well as you did. The lessons I have learn are have a clear head when working on these things. I tried to work at a place that was not to comfortable meaning mentally and also with other family issues going on. been avoided not making excuses everyone makes mistakes. The Mind plays games as well, Post #19 I checked the switch dogs. By the way "Problem Solved" IT was Switch DOG 4A was in the long position which had motor 4C and 1A closing together, a two second fix. And rolf_martin-062, I want to Thank You Again for your Patience and Understanding, as well as your Expertise Again. for having the patience helping me, and staying the distance as well. 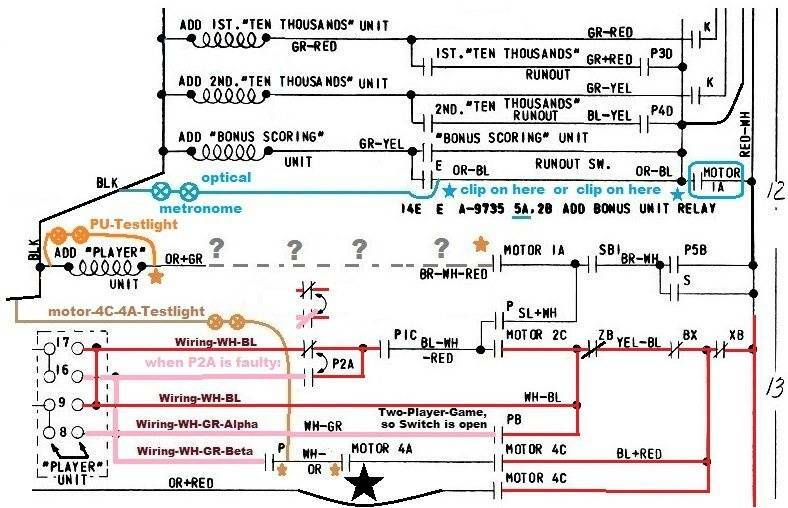 With his Great Post #22 explaining the circuits for the Player Unit!!! Plus stopping the score motor on post #28 and all of his other information!! Thanks for the video Fun With Pinball when he first answered my post on RGP. when it seem hopeless. And went out of his way to send a post to this group. His diagrams are very neat and helpful as well. It's nice to see people are out there and are giving there time and a helping hand especially on things they can't see. Switch Dog 4A was in the wrong position long instead of short. Thank You Mark for all your time and effort theirs a lot of good information here for others to lean as well as I did. 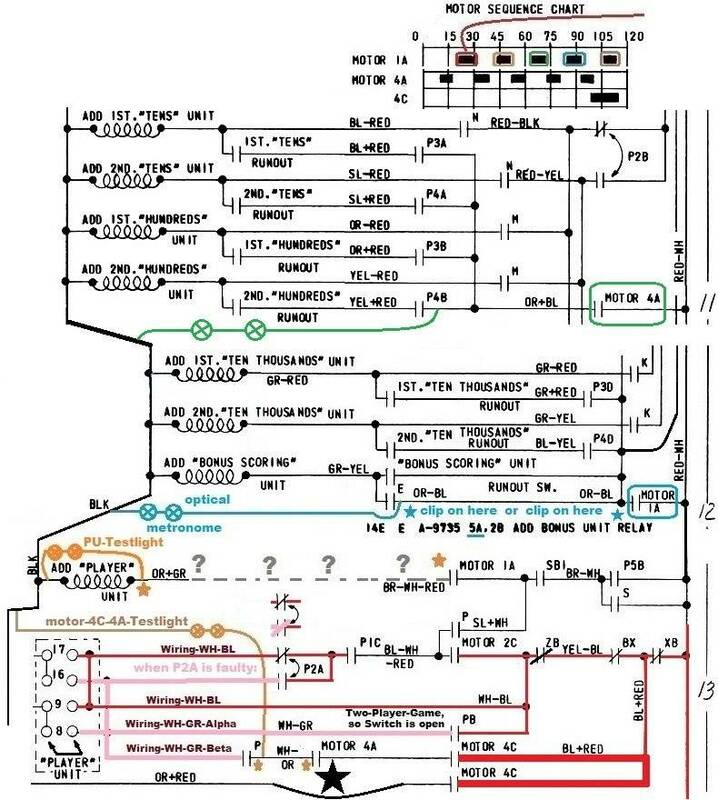 for all of his time and effort linking the pulses together Post #67 made me check the switches and wound up comparing motor 4A with Motor 1A and saw they were closing at the same time???? Also would like to Thank Pafasa for opening my mind to double check the switch dogs. You came in just at the right time and I thank you again. Congrats northstar. Go enjoy your newly working game!! I guess the other guys had enough,what else can I say?? except that all the time and hard work they put into the problem to solve it is well appreciated ,not just words said. rolf_martin_062, Mark G hopping the next one goes a lot better for you guys?